Thanks everyone who got involved, giving me awesome stuff and pointers on improving. Thanks P2STA for the insane render! Thanks Benji_D incredible Atlas brace! Thanks both P2STA and Nau for Gaernes! Check out my Facebook page and Youtube channel by pressing images below! Dude you're insane, those gears looks awesome!! Tooh't wrote: Dude you're insane, those gears looks awesome!! another good one dude ! My job is to take photos of dirt bikes. looks really clean man, nice work! Thanks everyone, I appreciate it! Very nice work Kawasakis. I would like to see another version of this gear with black bases instead of white. 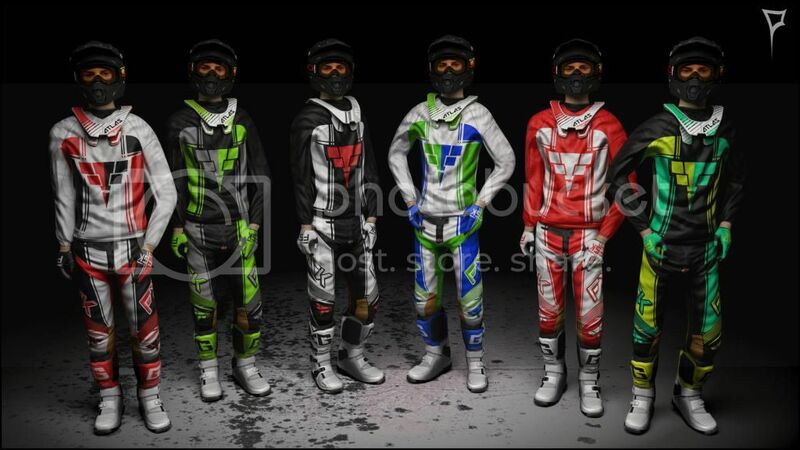 So the Red/White, Red/Black, and Blue/Green with black base instead of white. In my opinion, the white base with the shading that you are using makes it look a bit greyish. Thanks guys! Means a lot! ShackAttack12 wrote: Very nice work Kawasakis. I would like to see another version of this gear with black bases instead of white. So the Red/White, Red/Black, and Blue/Green with black base instead of white. In my opinion, the white base with the shading that you are using makes it look a bit greyish. I think in the game it looks pretty darn white, like it would look too white if I'd make it whiter.. I guess I'll have to do another pack with different color combos. SICK GEAR!!!!! Love it. Could we by any chance get a PSD?